The second day at Chez Bambi started well before dawn with us stumbling out of the house, trying not to wake the dogs. We drove through the sleeping countryside, for once I wasn't the chirpy one in the works van, the Bambi Basher's excitement was infectious. He's hunted everything huntable in the area and kept up a hilarious community on the farms we passed, the locals, and their foibles. It was nearing light as we left the road and passed into the woods. We were to meet up with a couple of his pals from work who had previously done their Deer Management Training with him. The chaps showed up shortly after our arrival and taking a side of the woods each we set off in search of Capreolus Capreolus. 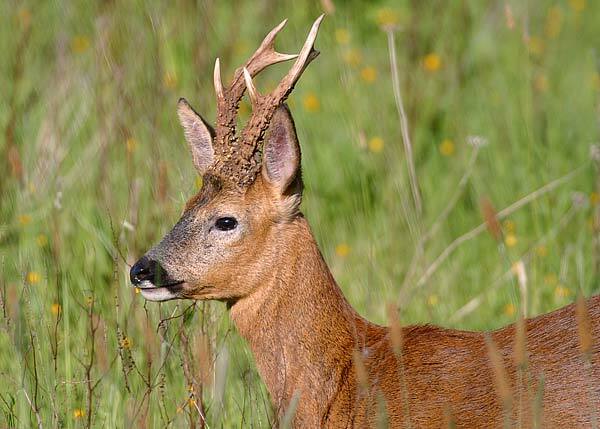 Here in old blighty, Roe Deer are found on heathland, grassland and in of course in woodlands. Roe Deer are often quite solitary creatures, although single Roe Deer does and youngsters of the previous year are often seen together. As we were in time for their mid-summer rut the bucks and does are seen together, this rule is sometimes confounded as groups of Roe Deer may feed in close proximity at other times of the year, attracted by the availability of foodstuffs, rather than the prospect of Chika-Chicka-Wah-Wah. Roe are the Kate Moss’ of the European woods: petit (65-73 centimetres / 26-29 inches at the shoulder), agile, ghostly creatures, with a passion for messy rock star boyfriends. (OK I made that bit up – write your own blog). The Roe Deer’s summer coat is a bright reddish brown; with a pale, powder-puff rump patch, which is fluffed out when alarmed. They are tailless, although in winter the females have a short tuft of white hair that looks like a tail. Colloquially known as‘ the shaving brush’ The Roe’s antlers are quite short, fairly straight, usually with three points on each side. BB - "think of it as armed rambling" we had worked our way around our half of the wood and met up with the others - they'd seen a highly shootable buck, but it had given them the slip. We split up again and with the chaps walking up into the part of the woods we'd just left. We were standing on a bit of high ground, the top of a natural drainage ditch when out of nowhere bounded a very handsome looking Roe Buck! He was defiantly at the higher end of the size range, Bambi Basher hissed "rifle" and pointed in the direction the deer would go, I dropped to one knee, shouldered the rifle, put my finger on the safety.............. WTF! A massive weimaraner bounded past, chasing the buck! The Roebuck was gone the the dog gave up and came back our way. With steam coming out of his ears Bambi Basher set off a ferocious pace in search of the dogs owner. When we found her she was apologetic to say the least, claiming the dog has escaped from the garden where he was usually safely locked up. WTF! You should have seen the one that got away!